USD/JPY: What is Behind this Power Move? All of the action in the currency market today centers around USD/JPY. Over the past 24 hours, the currency pair has surged close to 2 percent, pushing all of the Yen crosses higher. What Is Behind the Power Move? It is no secret that the Japanese love yield. They were the primary buyers behind the ever so popular carry trade that lasted from 2001 to 2007. On Wednesday, in my Daily Currency Focus, I talked about how investors sold long term bonds aggressively. This drove 10 year yields to the highest level since November 2008 and 30 year yields to the highest level since August 2008. Even though the carry trade collapsed in 2008, there are finally signs of stability (cue this morning’s U.S. durable goods and jobless claims report), giving Japanese investors the confidence to dip their toes back into the water. With their own country offering next to nothing yield, the Japanese are looking for other ways to earn some interest on their money. Therefore the rise in U.S. long term bond yields has attracted Japanese investors back into the Treasury markets. 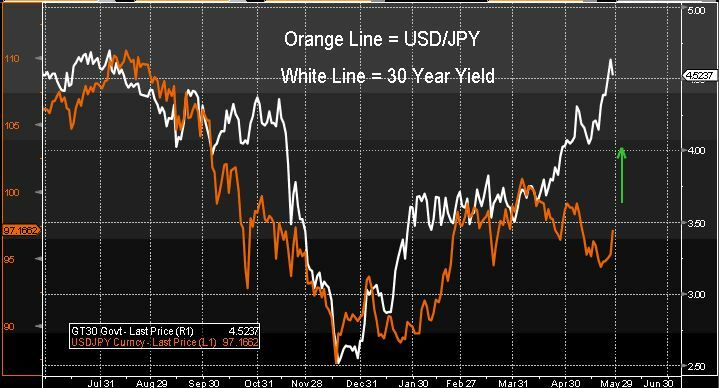 The following chart illustrates the correlation between the 30 year bond yield and USD/JPY. Judging from the chart below, there is decent chance that USD/JPY will test 100.